Ask fellow campers about "Middlefork RV Park" and nearby attractions. Unfortunately, this is about the only park available--couple others, but this is probably the better. The office had a complete computer meltdown when we arrived and reservations were confused but we got a space. The entire park is reclaimed dredge tailings and covered with small rocks that track into the trailer constantly., along with shiny mica flakes. The 'restroom' is a former construction office/restroom trailer and needs updating--only ONE shower/toilet/lav each for men/women, and the mens shower could use a complete makeover. If you want to stay in Fairplay, then this is probably the place, just don't expect much. Also, wifi was down the entire 5 days we were there, + ATT hotspot was poor. We camped at Middlefork RV Park in a Fifth Wheel. Not much in Fairplay, couple of shops, a museum and a restored mining town--South Park City. Brown Burro cafe is the breakfast place of record for everyone, ok not memorable. We stayed in Fairplay to observe the Gold Rush TV show operations and got to do that. These folks are doing it right. I got a call a week before arriving and there was a mixup with my reservation. I wasn't sure what I would get when I arrived, but they made everything right and we had a wonderful stay. There were some changes in management since I made my reservation 2 months prior. The staff is very friendly and my kids loved the gold panning. The only place in the area worth staying at! Entry and exit is a bit of a challenge in a large rig as you must navigate through a tight grocery store parking lot to the traffic signal on highway 285. They have done a lot to make the side of a river bed look nice with some freshly planted trees and native flowers. 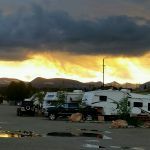 We camped at Middlefork RV Park in a Motorhome. Been here 7 weeks now on a work related stay. Rate based on monthly $650.00 rate. Nice park in the high mountains with decent size spots and great hosts. Camp hosts are great and owners are really friendly. All hookups work well and WiFi is better than most we have stayed at. No pool, but the weather is really a bit cool up here (mid to high 70's during the day and mid 40's at night) for that. Gold panning and fishing, nice mountain stream runs beside the park. Overall a great experience! We camped at Middlefork RV Park in a Travel Trailer. We have stayed at MiddleFork RV twice over the past three years. It is by far the most convenient place for campers and close to all of the scenic sites. There is an awesome grocery store nearby. The management is great and are very accommodating. If we ever come back to FairPlay we will definitely stay at Middle Fork again. We camped at Middlefork RV Park in a Travel Trailer. Be sure to tour South Park museum and go up Boreus Pass. We hiked to the very top on one of the trails and it was breathtaking. It was nice to come back to the camper and have full hookups after spending our days out and about. I stay at this park through the summer as it has all the rec. in the area. Well maintained great owners that seem to stay on top of things. At the park there is recreational gold panning, catch and release trout ponds that are well stocked. Views are breathtaking! We camped at Middlefork RV Park in a Travel Trailer. The park is on the out skirts of town and can walk to grocery store or downtown with lots of fun shops. Close by hiking and atving all around within 20 mi. The office staff were awesome. We were in a 43' Motorhome with 2 tows. They had a space to park the trailer. The pull through site was long enough for the coach and Jeep. It was a lot cheaper than Breckenridge and not as hot as Buena Vista would have been. This park has potential. Once their trees grow you will have shade. Our concern was all the dust. We found a lot of CO parks to be this way. It would be nice if they could water down the main drive to keep dust down. We camped at Middlefork RV Park in a Motorhome. Everything is pretty much the same as it was two years ago (see my previous review) except that they have raised the weekly and monthly rates to ridiculous extremes. Nightly rate isn't so bad, but I won't be able to be a monthly resident ever again. We camped at Middlefork RV Park in a Motorhome. Fishing and panning for gold. Also lots of 4WD trails in the area. Rated 8 instead of 10 because there is only one thing to do here (well, two if you're a fisherman): pan for gold. If you're not into gold panning you might not like this place! However, the tourist attractions in town would be walking distance at sea level. At nearly ten thousand feet, it may or may not be walking distance for you. The park is new, staff is friendly & knowledgeable, sites are reasonably level, bathroom seems clean (but I didn't use it), etc. but there are no shade trees, no playground/rec room, not even any picnic tables at the sites. You pan for gold. And there is plenty of gold there. I get gold in every pan full of dirt, which has never happened to me anywhere else I've prospected. They have pans, classifiers, etc. around for your use if you're a greenhorn, plus gold panning supplies (pans, sniffer bottles, vials, etc.) for sale at the office. I have lost track of the number of times I've camped here this season, but it's been quite a lot. P.S. The trout are HUGE. We camped at Middlefork RV Park in a Motorhome. Are you affiliated with Middlefork RV Park ?